All Year 8 pupils accompanied by two teachers and two trainees. Half the day was spent in Dewsbury Minster, the other half at Heckmondwike Mosque. This was part of an ongoing programme of learning outside the classroom at the school. 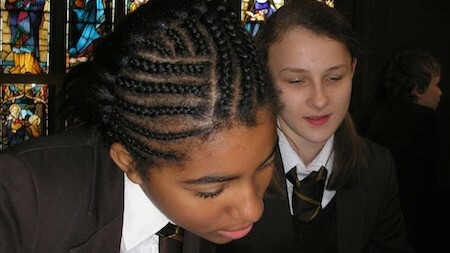 RE is also enriched through visits to other places of worship and a visit to the Holocaust Centre in Nottinghamshire. Pupils explored issues of global and local poverty. They played a fair trade game and participated in a quiz which considered the extent of poverty in the local community and worldwide. They searched for evidence of how Christians responded to problems and needs and explored the Minster in pairs. They were encouraged to look for evidence of this in the refectory, shop, notice boards and the church itself and quizzed local volunteers and visitors. This gave them a first-hand engagement with believers and an opportunity to listen to their views. At the mosque there was a focus on zakah, working in small groups to produce an advert for four Muslim charities. There were also workshops on hajj and prayer and an opportunity to try Islamic calligraphy. Back in school pupils took part in an evaluation session. This is regarded as an essential part of the RE experience.